Welcome to the best facials,massage and beauty treatment escape in Sydney's gorgeous Northern Beaches @ the famous Seka's Beauty Case @101 Darley Beauty Collective in Mona Vale. Our therapist are highly qualified and we take our treatments seriously. Advanced Cosmeceutical Facials, Cosmetic Skin Lightening, Collagen Induction Therapy, Skin Needling, Microdermabrasion, LED Facials, Ultra sound Facials, Galvanic Spa Therapy Facials, Corrective Facials, Aromatherapy Facials, Medical Grade Peels, Cosmetic Beauty Treatments, Massage, Hot Stone Massage, Anti Wrinkle injections, Fillers and Skin Rejuvenation. Escape to a tranquil place, a place where your wellness is nurtured to harmonise with your inner self, a place where care is personalised and life is celebrated. From the moment you enter our salon you will feel a wave wash over you. As your guide on this journey of rejuvenation we will tailor our range of beauty and body treatments to meet your personal needs and preferences. It is important to know the cause(s) of again, because as with treating any disease one must understand the problem, so that afterward the precise remedy can be applied. It is our belief that some of these theories of ageing may be a result of other theories. Many of them are interlinked, in the same complex way the biological processes of the body and the many factors affecting it are linked. However, approaching any one or a combination of the following theories with a specialised treatment protocol will assist the ageing problem on different levels, and help slow down and eradicate some of the so-called pillars of ageing. confidence. Seka's Beauty Case @101 Darley Beauty Collective offer a diverse range of treatments for ailments including: acne, pigmentation, sunburn and Melasma treatments. Our fully qualified skin technicians will help attend to everything from itchy skin to high end skin care. The most powerful and most efficient cosmetic lightening method against skin blemishes caused by melanin. Scientific and medical aspects of skin depigmentation. Melanogenesis is influenced by exogenous and endogenous factors which may lead to excessive localised melanin production. Said excess melanin appears in the form of ugly melanic blemishes, which in most cases no pathological importance. They are acquired skin blemishes, unike those of genetic origin. Cosmelan reduces and eliminates acquired skin blemishes of melanic origin, increases skin luminosity and equalises skin tone. Cosmelan is a versatile professional topical lightening procedure adaptable to any skin phototype and easy execution. We offer treatments and solutions for all skin types and conditions. High end skin care treatments used for eradicating acne and pigmentation, melanin are becoming increasingly popular due to pollution and other skin irritants in the environment. The beauty and skin experts at Seka's Beauty Case @101 Darley Beauty Collective are qualified to recognise the signs of skin deficiency and will effectively recommend products to eradicate any skin complaints. These products cover sun damage treatment, Melasma treatment, wrinkle treatment and sunburn treatments. All of our products are free from Paraben and artificial fragrances, and are suitable for sensitive skin, dry skin and itchy skin. Seka's Beauty Case @101 Darley Beauty Collective specialises in providing professional treatments for pigmentation and acne and offers trusted sun damage products to ensure a successful eradication of any skin problems. Skinstitut offers high end skin care products that remain cost effective. When it comes to your perfectly radiant skin, there shouldn’t be any compromises. To eradicate your skin condition please call (02) 9979 5678 for a professional consultation with one of our friendly experts. Not only will you get an analysis of your skin problem but we will offer an equally effective treatment plan. We are one of the top beauty salons in Sydney that cater to every skin type. Skinstitut is founded on the belief that serious, high-end skincare should be accessible to everyone. For this reason, we offer the most cost effective, cosmeceutical range using top-quality, potent and cutting-edge ingredients from all over the world. Coined in the 1930’s, a cosmetic is classed as a skin beautifying product that remains on the surface of the skin. A cosmetic can include cleansers, toners and moisturiser. Unable to create any structural changes within the skin, a cosmetic addresses and maintains present concerns of the skin. Cosmetics account for the bulk of skincare used by consumers and is generally purchased in a supermarket, pharmacy or department store. Cosmetics do not include a high percentage of active ingredients if any and are not generally prescribed by a qualified professional. Cosmeceutical on the other hand have been around since the early 1980’s and can be defined as the link between a cosmetic and a pharmaceutical. Cosmeceutical contain active ingredients such as Retinol and AHAs at high active concentrations and have the ability to create a structural change within the skin. Due to the nature and presence of active formulations, cosmeceutical should be prescribed by a trained and qualified skin professional. Cosmedical can be described as advanced cosmeceutical and are regarded as the newest and most sophisticated generation of skin care. Cosmedical correct not only past and present concerns, but have the ability to provide prevention for the future. They incorporate advancements in encapsulation, nano technology and peptides, as well as contain high grade chirally correct active ingredients, ensuring a more effective and results oriented approach to skin care. Cosmedical contain proven technology that is clinically tested, with the highest percentage of active ingredients without a prescription and can only be purchased through professional skin clinics and surgeries by a trained and qualified professional. 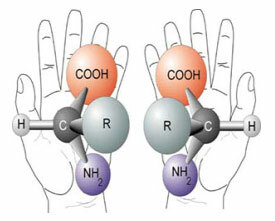 Chiral technology was first discovered by a French scientist, Louis Pasteur in 1848 and works on the premise that molecules have two identical sides Left (L) and Right (D). Although you would expect “right handed” molecules to be indicated with an “R”, it is in fact a “D” (from “dextro – Latin for “right”) i.e., Chirally corrected Vitamin E is listed on ingredient labels as D-Tocopheral on a chirally corrected product. The arrangement of these molecules determines the properties and benefits they possess. Although in many cases the two sides may appear identical, they do not always feature the same attributes or benefits. Think of it like a right handed person trying to put on a left handed glove - it just won’t fit. Likewise also, think of playing a game of tennis left handed when you are naturally right handed – you lose your potential strength and thus forfeit a winning match. These same principles can be applied to the ingredients in a daily skin care regime. The Chirally correct form of Vitamin C as an example is L-Ascorbic Acid. Scientifically, Ascorbic Acid (which is not Chirally correct) has been proven to not only be highly unstable in skin care preparations, but also ineffective in delivering any results. When looking at the Ascorbic Acid molecule, we learn that it’s dominant side is “left handed”, if we then chirally correct this, Ascorbic Acid then becomes L-Ascorbic Acid – a much more effective ingredient for creating skin change. The make-up of a molecule depends on which side is more effective when Chirally corrected – D-Panthenol or D-Tocepherol are the chirally correct forms of Pro-Vitamin B5 and Vitamin E, whilst L-Mandelic or L-Glycolic are the chirally correct forms of Mandelic and Glycolic acids. Just as with prescription and pharmaceutical drugs (which are always chirally corrected), the advantage of using such technology ensures that the more effective side of the molecule is utilised to form a better bond with the skin’s cells, ensuring a more active and results-oriented delivery of active ingredients. Alpha Hydroxy Acids or AHAs is the family name for a group of naturally occurring acids found both in plant matter and the human body. The primary use of AHAs in cosmeceutical is as both exfoliators and as hydrators. They are generally used to treat the symptoms of such skin conditions including, photo-damaged, pigmented, aged, dry and breakout prone. The associated benefits and results are dependent on the following three criteria; type; concentration and pH. Of these five choices, Glycolic and Lactic Acid have been proven scientifically to be most effective on the skin, not only because they have the smallest molecular structure of the AHA family, but because of their superior ability to hydrate and normalize the skin. The proven results from this serious skin care product are remarkable at a fraction of the price. Come into Seka’s Beauty Case and ask for Sonja or Shelby and book in for a consultation. I am a firm believer or this product and have been using it myself for 5 years. Dr Aspect, Skinstitut or Organic Manuka Honey are always developing new products and ingredients to ensure they are the leader in Cosmeceutical skincare. Cosmelan - The most powerful and efficient cosmetic lightening method against skin blemishes caused by melanin. -for more information regarding this treatment please call the salon to arrange a consultation. This treatment provides maximum healing by impregnating the skin’s upper layers with glycolic and AHA’s to kill the bacteria. Excellent for skin balancing combination or acne prone skin. Includes back and shoulder massage. This treatment provides maximum hydrating action.. Excellent for skin that is dehydrated, devitalised, sensitive, ageing or sun damaged. Includes cleanse, tone, exfoliation, hydrating masque and eye masque, facial massage, arm massage, head massage, shoulder and neck massage and Includes eyebrow wax and eyebrow tint. Lunchtime Clairderm Medical Grade Microdermbrasion $65 - "buy a course of 5 for $250"
(facial peeling gel, Hydrating Nourishing Cream Mask & Intensive Nourishing Cream, + Vitamin C or Rejuvenation ampoule Facial. Combining the riches of minerals and oils to improve the skin on many levels from detoxifying to firming with pure essential oils and massage for aromatherapeutic results. We start by cleansing the feet with a foot massage then proceeding with a neck and shoulder massage before a complete facial including exfoliation, facial massage and application of rich and nourishing multi-vitamin masks selected for your skin type and balancing properties and then to complete the ritual a soothing foot massage. An instant skin plumping eye treat to reduce fine lines and deeply hydrate the eye contours. Marine and collagen proteins absorb moisture, tighten and brighten the dedicate tissue leaving your eyes smooth and youthful. Breathe and relax as your therapist takes you down the most relaxing journey of your life. De-stress your entire being, mind body and spirit. Combined with essentials oils and minerals that will improve the circulation in your muscles and help clear your mind. Enjoy the candle lit room, sounds of soft music and escape your busy life in our tranquil environment. Enjoy a herbal tea whilst we get your essential oils and hot stones ready for your breath taking massage. Sit back and indulge!!! !Mavex designed the first Foot Beauty and Wellness line, all natural and rich in active ingredients from organic farming. All the extraordinary power of nature and mountains enclosed in an infinitely delicate treatment, capable not ony of heal and protect, but also of giving a deep sense of balance to body and mind. A rich concentrate of precious natural active ingredients, natural organic without parabens, formaldehyde, added preservatives, mineral oil or parafins.